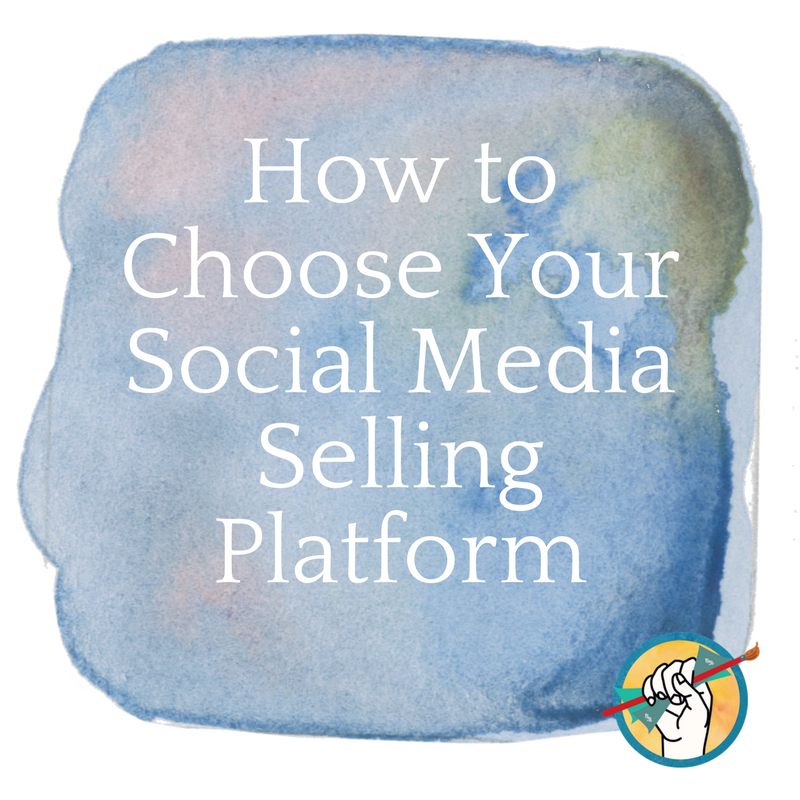 Here’s how to choose the right social media selling platform for your art business. You’re well aware by now that if you’re selling your art online, you need to have a solid social media presence. The caveat is that each social network is different, and stretching yourself too thin by trying to maintain a presence on every network will equal disappointing results. But how do you choose which network to focus your energy on? We’ve put together a rundown of the 3 major networks that can be used as selling platforms. Ask yourself the questions below to help you narrow down which option will work the best for your art business. Instagram is not just the domain of impossible yoga poses on mountain peaks and picture-perfect brunch. It can also be a powerful selling tool, provided you find your audience there. Instagram is great for artists because it is intended specifically for visual media. Where Facebook allows for enormous amounts of text, Instagram provides bite-sized and perfectly-square photos. You can open a regular account, and when you’re ready switch it over to Instagram for Business.When you switch your profile to a business account, Instagram provides you with insights on your stories, posts, and followers. You can also add extra information about your business to your profile. Hashtags are an effective way to attract new followers interested in your exact niche. Some of Instagram’s very desirable functionalities are currently restricted to accounts with 10k+ followers. This includes the ability to add a direct link to your Instagram story that allows viewers to swipe up to be taken directly to your website. Without this ability, the only place you can add a clickable link is in your profile. A common workaround is to temporarily change your profile link to the URL you want to direct your followers to, such as a new blog post or the link to a page to purchase your newest piece of art. Currently you can’t add clickable links to your regular posts. It also isn’t possible to copy/paste text from an Instagram post using your smartphone, so it’s practically useless to include a link in your caption. While you can access Instagram from a desktop computer, you can’t create a new post from a desktop. You’ll need a smartphone or tablet, preferably with a good camera. Factor Instagram ads into your marketing budget if you are planning to use it as an advertising platform. @livingpattern. 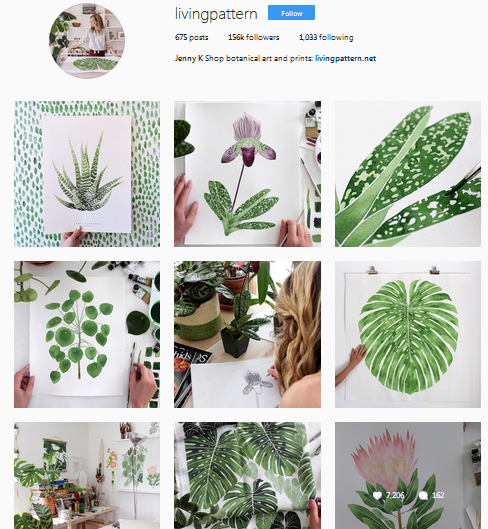 Jenny Kiker is a botanical artist with 156k followers. One look at her feed and it’s easy to see why- it’s a very very beautiful and cohesive feed with bright photos and lots of white and green. A quick glance makes it clear what she does. Jenny includes exclusive discount codes in many of her captions, which adds a little extra value to being a follower. She posts photos of her finished art, her work space, and her works in progress. All are very well lit. @amirarahimart Amira Rahim is an abstract artist with 55.7k followers. Her feed is colorful, but consistently so (the recurring theme here for successful and attractive IG feeds is consistency). Amira posts many photos of works in progress, as well as charming pictures of her smiling face sprinkled in with inspirational quotes, things she finds inspiring (i.e. nature), and photos of her work framed on people’s walls. Is it right for you? Questions to ask yourself. Do you spend a lot of time using your smartphone? You need to be comfortable spending time in the Instagram app every day. Get comfortable using your phone’s camera and figure out what built-in editing features your camera has as well as those included in the Instagram app. Do you already use Instagram? An understanding of the way Instagram works and IG best-practices in general will give you a leg up on getting started. Instagram may be casually used for personal profiles, but for those looking to leverage Instagram for their business, your feed must be thoughtfully curated with good photography and the right balance of text and strategic use of hashtags. Try a tactic uniquely suited to Instagram, like a flash sale. 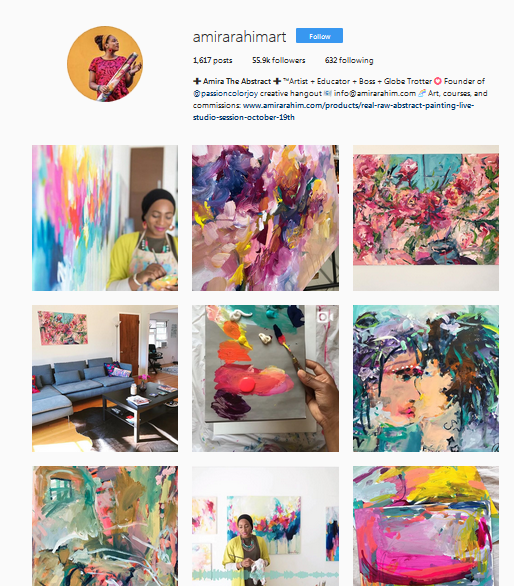 For more tips on leveraging Instagram to sell your art, check out our blog post How to Sell Art on Instagram. For a more in-depth list of artists doing cool things on Instagram, check out 7 Inspiring Artists on Instagram. Facebook’s business dashboard, Ads Manager, is a very useful full-service advertising dashboard with extremely customizable analytics. You can very finely target segments of your audience for higher conversion rates. If you notice that a regular post is doing well, Facebook gives you the option to pay to “boost” the post, which puts it in front of more people. This can be really useful for a post about an upcoming art show or your newest series of work for sale. Facebook runs a complex algorithm, and your organic (non-paid) posts are likely to be shown to only a small fraction of your total audience. You will have difficulty selling through Facebook without a more significant monetary investment. To get the most out of the Ads Manager dashboard and insights you need an intermediate-to-advanced understanding of marketing. Understanding marketing-speak is helpful here. You need to be willing to spend some cash figuring out what ads do and don’t work. Unlike Instagram, your Facebook account and ads/promotions can be run entirely from a desktop computer. The standard advertising budget recommendation is $5-$10 per day minimum for a month before you can expect to see a return. You may wish to take advantage of a post scheduling dashboard like Hootsuite or Buffer, which will allow you to craft Facebook posts in advance and then schedule them to post automatically. This can be useful for times when you know you’ll be too busy to post regularly but want to stay in front of your fans. 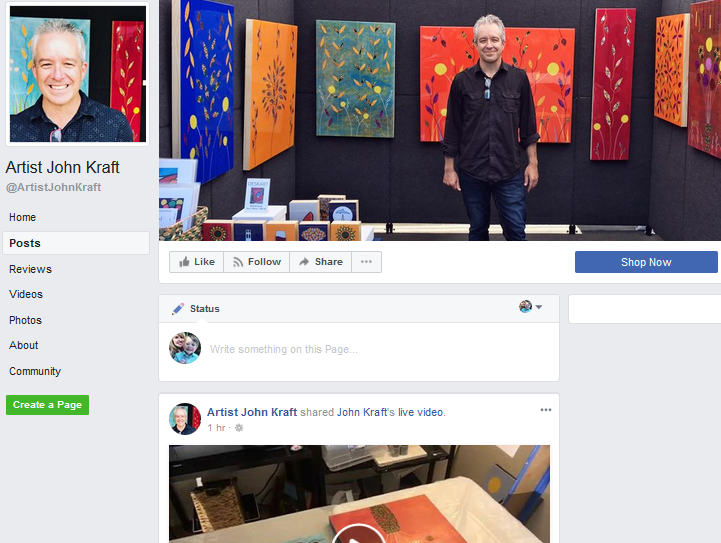 John Kraft makes great use of Facebook’s live video feature to share current works-in-progress in the studio. He shares upcoming events, photos of his artwork in progress, and collector photos of his work installed on display. Natasha Wescoat has 50k+ followers on Facebook. She shares timelapse painting videos, which are very popular among collectors and fans. She shares new pieces, as well as occasional promos for events she’s attending. Is your target audience hanging out on Facebook? Don’t know who your target audience is? 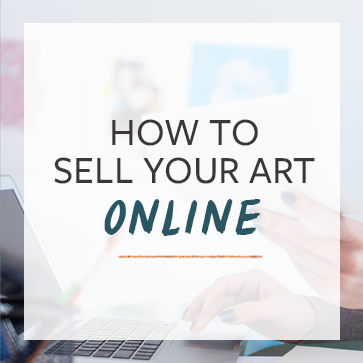 Check out this post to learn how to research your online art market. Do you have a marketing budget to spend on boosted posts and/or ads? Do you feel comfortable testing out different ads, and can you understand the analytics reports Facebook provides? Do you spend a lot of time on Facebook already, and have a good understanding of how it works? Those who are very internet-literate can tell immediately when someone else isn’t very familiar with the platform, and it can be a turn-off to potential collectors. 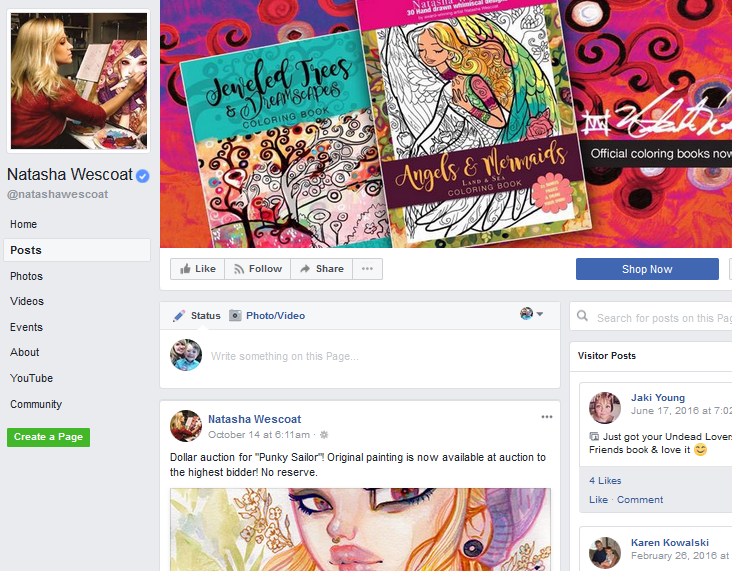 It is possible to have success there: How I Made $50,000 Selling Art on Facebook. 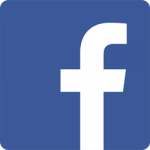 Ready to get started selling your work on Facebook? Check out Facebook Marketing for Artists. Pinterest is an extremely visual platform, and beautiful images will be more successful. Provided you can photograph your work well, this is a great advantage for fine artists. There is great potential to have your work shared. Each “repin” puts your work in front of all of that person’s followers (with some exceptions, see below). You can create “buyable pins” for free- these pins have a price, but are otherwise very subtle- i.e., they don’t stand out as advertisements. Pinterest is saturated with people and companies who know how to play the game. There is no room here for sub-par graphics. You will need to spend the time creating high-quality repinnable images. Pinterest no longer shows pins chronologically, so you need to prove that your content is good before they will show your pin to anyone. Your descriptions should be thoughtful and relevant to the image and the content it links to. The more high-quality content you post, rich in relevant keywords and linking to good content, the higher the chance that Pinterest will allow your pins to be seen. A marketing budget if you plan to pay extra to promote your pins. An understanding of keywords and SEO best practices. It comes as a surprise to many that hashtags are worthless on Pinterest. Rather, you want to share images that have good meta-text, and descriptions that are rich in keywords but not spammy (the difference between “nighttime stars painting night sky art sparkle” and “painting of a sparkling night sky”). Patricia Vargas has enabled buyable pins on her Parima Studio board, which displays pins of her work as well as shots of her studio. 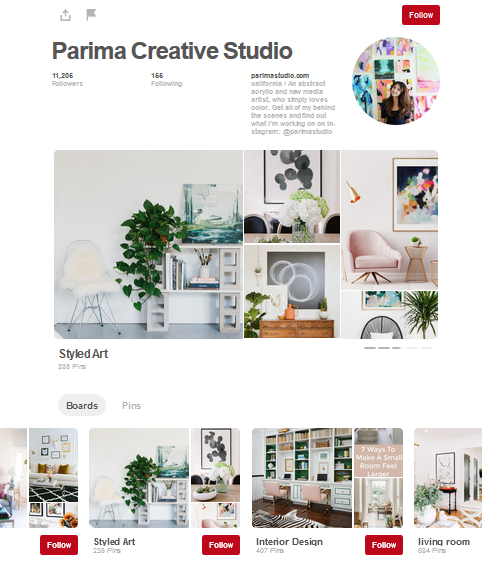 Pinterest is the #1 traffic source for Patricia, thanks to her beautiful and cohesive boards. Do you have a large inventory you can use to create buyable pins from? Do you have good, engaging blog content you can link to, and once people are on your site do you have a quick and clear call to action? The most beautiful pins won’t be worth anything to your business if potential collectors click through to a website that doesn’t convert. Are you interested in spending time every day building out your Pinterest boards? You’ll need to pin more than your own work to attract new followers and avoid being seen as overly self-promotional. If Pinterest is the right choice for you, head over to grab Melyssa Griffin’s awesome Pinterest course Pinfinite Growth. If this all feels a little overwhelming, don’t fret. As you’re determining which platform to use to sell your art, it ultimately boils down to one simple question: which one will you use? The most effective social media platform is the one you’re willing to spend your time and money learning about and posting to consistently. So make your choice, and check out the resources linked above under each section for additional help. Need extra advice and accountability? The Abundant Artist Association is a growing community of professional artists in all stages of their careers joining together for support, monthly challenges, and even in-person meetups. Learn more here. I had not thought about Instagram or Pinterest as these will be an awesome way to showcase our work to others. I am excited about being part of this art community The Abundant Artist. No mention of Twitter. I’m getting the impression it isn’t big in the USA, but it certainly is in the UK. Thanks for this great article. I’m not an artist, but I’m in a creative field and all of your advice still applies. The majority of people in my field use Instagram, mainly because they’re focused on building brand awareness, rather than selling a specific product. I really appreciate that you’ve listed positives and negatives of each platform, this will help me make an informed decision. Ultimately, though, I agree with your final point: the best platform to use is the one you actually will use.